How can you not yet understand? Oh silly heart, he’s gone. It is no more, it shall never be again. 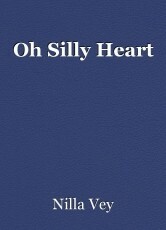 Oh silly silly foolish heart, why do you continue to care? You chose. This sacrifice is for you. You are healing, didn’t you know? So why do you continue to complain. You are stronger now, I’ve told you over and over again. You have smiled many times and will continue to do so. So why do you cry? Why do you miss him? He is gone. Be calm. I love the voice and style you chose to write this in; it's different and makes the message even stronger.